United Nations agencies and programmes are helping to eradicate illiteracy by supporting projects which seek to expand and improve educational structures in line with the economic, social and cultural realities of a country. 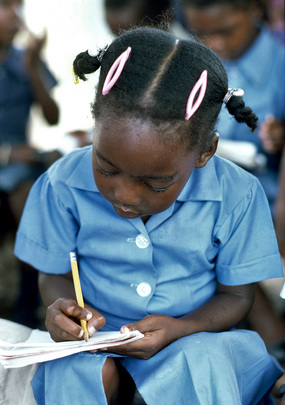 Child at an outdoor class runs by the local community for the children of squatters in Vere, Jamaica. 1986.